U17 A1 Criteria This is a criteria/brief of Unit 17 - Project planning assignment 1, this includes P1, P2, P3, and M1. Unit 7 Assignment 3 [Alterations] THIS DOCUMENT IS TO BE USED IN UNISON WITH THAT OF \'UNIT 7 ASSIGNMENT 3\' WHICH CAN BE FOUND ON MY PROFILE. Throughout this report is the work of which achieved me the highest possible grade. All of my work was to distinction standard throughout the 2 year course. U22 A1 Criteria This is the criteria/brief for unit 22 - developing computer games assignment 1, covering P1, P2, D1. U36 A3 Criteria This is the criteria/brief for unit 36 - computer game platforms, including P4, M4, and D4. Unit 31 Assignment 3 Throughout this report is the work of which achieved me the highest possible grade. All of my work was to distinction standard throughout the 2 year course. Unit 4 Assignment 1 Throughout this report is the work of which achieved me the highest possible grade. All of my work was to distinction standard throughout the 2 year course. Unit 31 Assignment 2 (Part 2) THIS WORK SHOULD BE USED IN UNISON WITH PART 1 (THIS CAN BE FOUND ON MY PROFILE). Throughout this report is the work of which achieved me the highest possible grade. All of my work was to distinction standard throughout the 2 year course. Unit 4 Assignment 2 Throughout this report is the work of which achieved me the highest possible grade. All of my work was to distinction standard throughout the 2 year course. Unit 17 - P4, M2 - Project Specification & Impact of Risk This is P4 and M2 of Unit 17 - Project planning, this covers everything for the project specification and impacts of potential risk. Unit 36 - P1, M1, D1 - Evolution of Video Game Platforms This is P1, M1, and D1 of Unit 36 - Computer game platforms, this covers the evolution of arcade machines, gaming consoles, portable gaming, mobile gaming, and PC gaming in a timeline order. This document does not include Television as my teachers find it irrelevant and out of date in modern gaming. Unit 17 - P2, P3, M1 - Project Management Report This is P2, P3 and M1 of Unit 17 - Project planning, this covers everything in the specification for project management resources and methodologies, issues affecting project management, why projects fail, and examples. Unit 16 P1,P3 & M1 Unit 16 Assignment 1 including Pass Criteria 1 and 3 with Merit one as well. i received full marks with the assignment no re submission was needed. Unit 17 - P7, D2 - Project Evaluation This is P7 and D2 of Unit 17 - Project planning, this covers everything in the specification for the project evaluation and project tools. Unit 23 - P1, D1 - Impacts of HCI and Future Developments This is P1 and D1 of Unit 23 - Human computer interaction, this covers everything in the specification for the impacts of HCI and examples of my choice - self driving cars and amazon go. The timeline of HCI for P1 is in another document. Unit 22 - P1, P2, D1 - Impacts, Types, and Psychological effects of games This is P1, P2 and D1 of Unit 22 - Developing computer games, this is a 5888 word 'magazine article' of the impacts, genres, and effect of video games on society, covering everything in the specification. U17 A2 Criteria This is the criteria/brief for assignment 2 of Unit 17 - Project planning, this includes p4, m2, p6, m3, p5, and d1. Unit 17 - P5 - Project Schedule This is P5 of Unit 17 - Project planning, includes a project schedule created on Microsoft Project and further details. 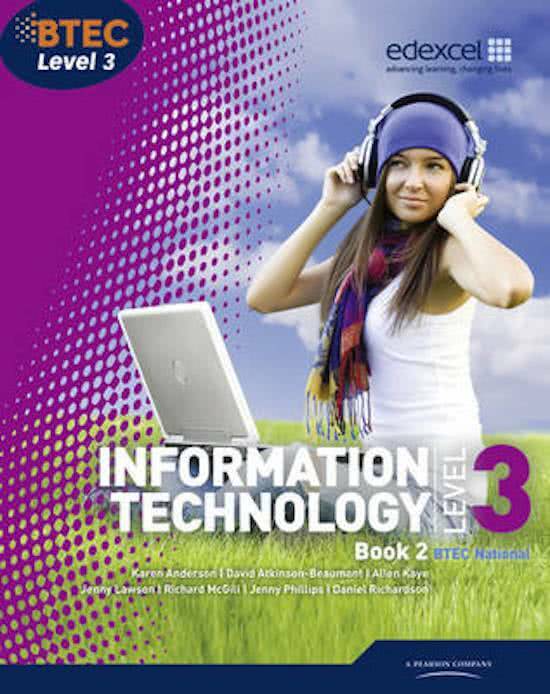 On this page you find summaries, notes, study guides and many more for the study book BTEC Level 3 National IT Student Book 2, written by Karen Anderson & Allen Kaye. The summaries are written by students themselves, which gives you the best possible insight into what is important to study about this book. Subjects like M3, D1, P2, P5, M2, M1, P4 & D2 will be dealt with.